On RevJet, marketers can for the first time unify all marketing creative use cases in one comprehensive, custom-tailored system of record, systematically combining creativity and science to drive ever-higher performing creative content across all digital marketing channels. Make personalization simple and straightforward. With the Orora suite for creative production you can easily build, iterate & translate ads for any placement. Paired with the Orora DCO bundle, you can now build audience-based marketing campaigns, effortlessly trafficked for any segment. Read how Bridgestone generated audience-centric campaigns for each of their unique offerings. Make data-driven decisions by running high-velocity performance campaign from within a single end-to-end operating system. Easily organize your experiments in order to take swift action to optimize your digital marketing strategies. See how LendingTree increased the velocity of experimentation by working on the Orora Operating System. Run creative tests to effortlessly improve the performance of your marketing creatives. View overviews of campaign performance and quickly analyze the results in Flight Deck to optimize your digital advertising strategies. 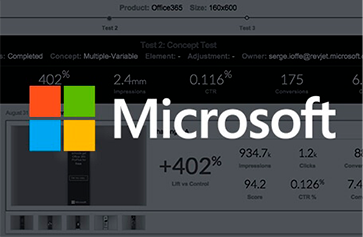 Learn how within just eight weeks, Microsoft reported an average lift of 133% on their marketing creatives, resulting in 5X more conversions. The Orora Operating System provides the team visibility to transform marketing from opinion-driven to data-driven. With forever memory you can see data for every creative from any channel, beautifully presented within a single platform. Determine what impacts your audience’s attention or motivates their actions using heatmaps. Read how Franklin Templeton transitioned to data-driven marketing and is now rolling out the Orora operating system worldwide.